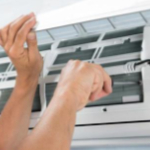 Keep your air conditioner system in top condition with a regular service from the experienced air conditioning and refrigeration team at Sea Air. Our technicians can carry out all the necessary system checks, diagnostics and routine repairs to ensure your air con keeps your business cool in summer and warm all through winter. Want reliable air con all year round? Routine servicing and maintenance ensure your air conditioner will heat and cool when you need it most. For most businesses the climate control system is essential to smooth, efficient operation, and a significant asset. Maintaining the unit or units in your building regularly provides many benefits. Ensures reliability - regular servicing ensures the system runs all year round. Extends the life of the air con system - faulty air conditioners wear out quicker than well-maintained units do. This also reduces replacement costs in the long term. Uncovers issues early - many small problems are discovered during servicing allowing for repairs to be carried out before larger issues develop. Keeps the air clean - cleaning and servicing ducts, filters, coils, fins, and other internal components help to provide clean, fresh air throughout the building. Maintains efficiency - keeping running costs as low as possible by ensuring the system is running at its most efficient. Reduces breakdowns at peak time - steaming hot summer days when the air conditioning system is working the hardest and when you need it the most tend to be when failures occur. Keeping the system in top condition reduces the chance of disruptions. The correct level of air conditioner refrigerant ensures the unit can cool or heat to the required temperature and maintain it easily. Any loss in the refrigerant, whether from incorrect installation or a leak, can affect the performance of your air conditioner. Our licenced refrigeration mechanics will check the gas levels in your unit, carry out any leak repairs and top up where needed. Sea Air can take care of all your commercial air conditioning servicing and maintenance requirements from small single split systems to large ducted air con units. For the very best in air con service across Brisbane northside and the Sunshine Coast contact our team on 0401 787 183 or complete online job booking form today.